A Monthly Magazine Devoted to Mental and Spiritual Phenomena, Including Psychometry, Clairvoyance, Clairaudience, Mesmerism, Trance, Inspiration, and Physical Mediumship; Prayer, Mind, and Magnetic Healing; and all Classes of Psychical Effect. 1/1-2 March and June 1882-6/7, July 1887 (last?). $1.50 a year. This was the organ of the most egregiously phenomenal side of spiritualism in the 1880s, opening its pages freely to the likes of J. William Fletcher, Henry Slade, Pierre L.O.A. Keeler, Anna Kimbal, J.V. Mansfield, Mary B. Thayer, James A. Bliss, Henry Rogers, and others. Its theoretical standpoint, to the extent it had one, was given on the title page of its bound volumes: "Prove the Truth of all Science, and we do not know by any other means any Truth; we, therefore, give the so-called Facts of our Contributors to prove the Intellectual Part of Man to be Immortal." In practice, the journal functioned as an advertising vehicle for its contributors, who used its pages to describe the wonders they produced. 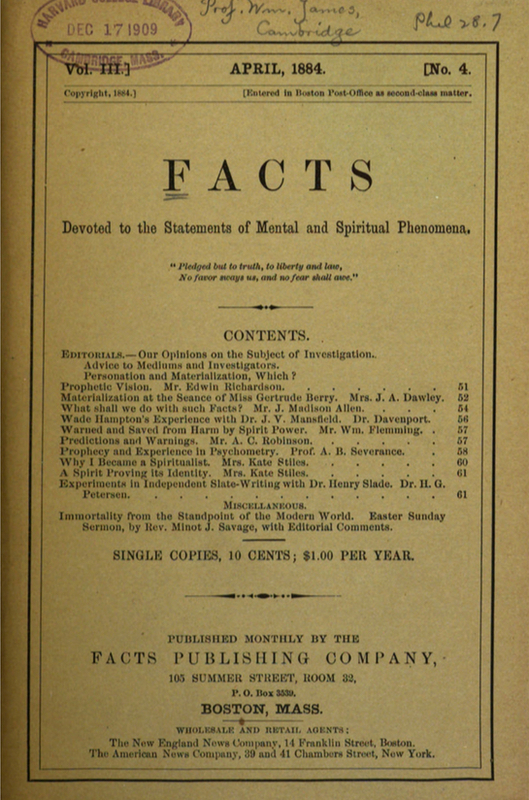 Whitlock, whose wife was the house medium for the journal, was a long-time publisher who published other journals unrelated to spiritualism both before and after this venture. Harvard University; Kent State University; University of Texas, Austin; Wisconsin Historical Society; Cleveland Public Library; Kent State University; NSAC Lily Dale (entire run); Wisconsin Historical Society.